Like what you see… then wait until you see this! In the Fall of 2018 we are excited to announce the launch of our affiliate The Chicken Noodle Soup Company. Here you will be able to include the BEST hand crafted chicken noodle soup in your Gift Basket! Included in the CHICKEN NOODLE SOUP COLLECTION is our delicious soup, our signature Blueberry Smash Muffin and a ceramic crock to savor the soup! 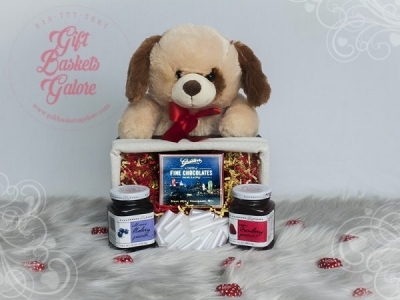 Here you can send the gift of soup or include this exclusive soup package in one of our charming gift baskets. If you are hungry… do not read this! We are making the soup now… it’ll be ready this fall! Handcrafted Chicken Noodle Soup is slow simmered with the finest and freshest ingredients. Savor the aromatic smell of the butter tender chicken pieces simmered in a rich, creamy broth with the finest selection of organic carrots, onions and celery and garlic. Crafted with a smooth, tender egg noodle and our selection of secret spices that will leave you wanting more. Our skillful preparation is based on a decades-long commitment to making THE best scratch prepared Chicken Noodle Soup on the market. This culinary masterpiece is accompanied with our famous Blueberry Smash Muffin and a Chicken soup Crock to enjoy for years to come. Experience comfort food at its finest.